These Apple Hand Pies are the perfect little grab and eat on the go dessert and great for little hands to hold. 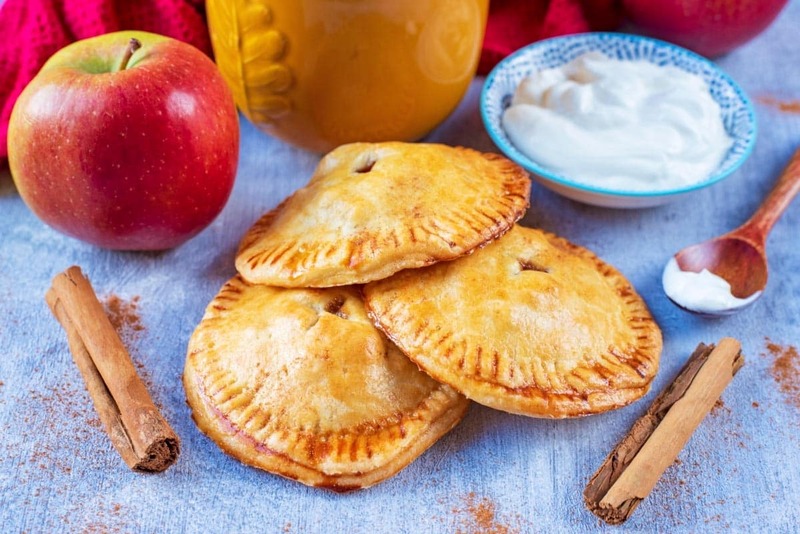 Little circle pastry pockets filled with delicious chunks of cinnamon-y apples that are a lower calories sweet treat. Chop the apples in to small chunks. The smaller the chunks, the easier for them to stay in the little pies. Melt the butter in a large pan and then add the apples, Hermesetas Granulated Sweetener, cinnamon and vanilla and mix well. Gently cook for 3-4 minutes, until the apples have softened. Allow to cool completely. Roll out the ready make short crust pastry and then using a cup or cookie cutter that is about 4 inches in diameter, cut out 10 circle (this will make 5 hand pies). Place 5 of the circles on a lined baking sheet (use 2 sheets if there is not enough room) and then divide the apples between them. You will need about 2-3 tbsp of filling per pie, making sure there is an edge around the pie. Put the other pastry circles on top and then carefully crimp around the edge using a small fork. Make a slit in the middle and then after mixing the egg and milk together, use it as an egg wash to brush over the pies. Put in a preheated oven at 190C for 18-20 minutes, until the pastry has cooked. You can use any kind of apple for this recipe, or even use a mixture if you have some that need using up. 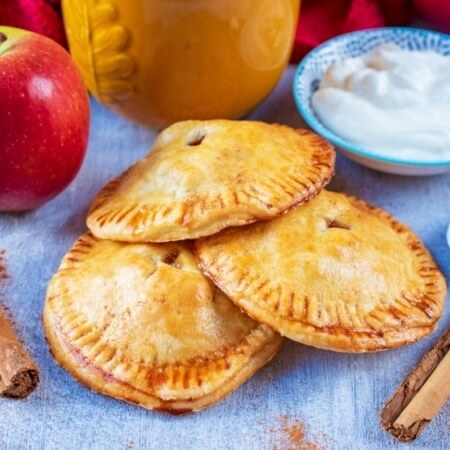 We went with cinnamon as the spice for these apple hand pies, but you could swap it for ginger or nutmeg, or use a mixture of all three. Not a fan of apples? You can make a berry version of these or even swap the apple for pears. Feel free to get creative with the shape pies you make, and use cookie cutters. Make sure to look for a ready made pastry that is as low in sugar (or sugar free) as possible.